Weaning B Off Mommy’s Milk..
All this while, she was still breastfeeding. Even when I go to work and during oncall nights, my fridge is full of milk for B. Everyday I expressed milk at workplace religiously. Now I guess it’s a good time to wean her off slowly.. I’m gonna start her on formula milk during daytime and mommy’s milk at night.. I truly wish I can continue to breastfeed her up until two years as recommended in the Al-Quran but I have my own reason for doing this. And I’m not telling you yet 😉 That one will be in another entry 😀 Promise!! I’ve asked many of my paediatrician friends on choosing the right milk for Little B. I read the article about excessive sugar (lactose) in formula feeding that became a big issue in the US recently. And also I saw the advertisement about no-sugar-added Anmum Essential milk.. I got really confused, I believe many mommies feels the same way too.. Many of my paediatrician friends said that the milk is actually depending on the baby, you can give so-called the best formula on the shelf, but again if it doesn’t suit your baby, it won’t work.. So, yesterday I went to the supermarket. First time in the susu aisle..
Oh Em Gee!! I never knew I have too many options.. I got headache just by looking at the choices.. So, mommies out there, may I know what formula milk do you give to your babies? Posted on June 22, 2012 November 27, 2012 by Dr Halina Mohd YunosPosted in MommyhoodTagged milk. Next Next post: B’s Fav Spot..
Bella nak ada adik dah ke? Gave my baby Anmum but changed to S26 when she was 9 mths. Check it out the formula yang ada kes melamine…. me pun pilih anmum yang kurang gula tambahan tu..
ada doktor kata anmum pun ada gak gula..masa preggy pun ramai ibu2 minum anmum utk ibu mengandung tu kan..sbb tu ramai ibu2 membesar lepas bersalin..
Salam. ha saya minum anmum masa pregnant tu berat naik melampau. nurse pun cakap benda sama, anmum ni mostly bg berat naik mendadak. dia advise minum fresh milk or low fat milk aja. pas drp x minum tu, berat saya x la naik teruk sangat..tp saya pun x pasti ye ke anmum tu penyebabnya. ihihi. u cn try herbalife, before it give more nutrition for ur bby. before dis..i give my daughter snow..but my daughter was constipation..so, i change to enfalac A+…alhamdulillah..my daughter very enjoy it..
same with me…before this also i gave my daughter snow but change it to enfalac a+..
my doter 8 months minum lactogen during daytime…and still bf…i guess lactogen rasa lebih kurang ngan my milk! I agree 100% with Umie…. i dah wat ‘so-called-experiment’ (mcm saintis la plak) U can see lactogen milk colour compared to others, Its colour is pucat2 n cair2 gitu, just like our milk, (the taste i tak tau plak, bagus la, looks like umie, u did ur own experiment 2.. hehehe) compared to other formula, the colour of them is very yellowish, i assume byk lactose. well, u can try ur own. and taste it urself. and the harga, veeerrryyy affordable tau?… enfalac or enfagrow pon okay, and the colour is verry yellowwish and the taste, yup, its too sweet. Plus, the price is quite expensive. Well, this is my opinion… or u can just do the experiment ur own…. gud luck!! betul kah kak ratna, saya pertama kali cuba lactogen…anak saya ok. before dia minum s26 tapi badan dia tak ada perubahan so saya try lactogen sebab tengok byk budak badan dia berisi minum susu tu. anak saya dulu premature … sekarang ni underweight plak…mungkin s26 tak ngam kot. baru 2 minggu ni dia try lactogen..hopefully dia punya berat naik nanti & berisi sikit. salam..nak tanya puan..s26 ni ada masalah motion tak?like my baby 2 tau 3 ari skali baru past motion..
my bb akan setahun 28jun ni..so i decide akan tukar susu dari enfalac prosobee ke gain plus IQ..
Oyeke..anak saya pun takleh minum susu lembu..
muntah2 dan naik bintik2 ..nak tryla susu yg akak bg anak akak tu. my boys 3yo and 1.9 yo(+ bf) consume Biolac frm Era Edar Marketing. i did try biolac too.. mcm ok, plus nak support local production (it is, isnt it?) tp lepas tu mcm susah nk dpt so back to 123.
after 1yr, i just try to switch to whatever applicable- cheap and kids like it hehe u shud know they cost a bomb! nieda…when my was born..i gave her similac..just for 2 days..n my bb got da jaundis..so change to snow..but not suitable for her..she always constipation..now i give her enfalac A+..erm..i think i want to change to da similac..what ur opinion? nieda, I just change my 2 y.o boy with lactogen, before he drink S26 but no improvement. He underweight and look small. I always go for survey and ever think to mix with abott brand. Hopefully his body fatter sikit & pertambahan berat. Can u suggest to me Abbott milk yang sesuai & boleh tak saya selang seli kan dengan Lactogen. for my 1st son, nk enfagrow je. yg lain x sesuai..sembelit la sakit perut la.. yg 2nd son, sesuai ngan Gain IQ plus..dah lpas 3 tahun br dia ok ngan susu lain. snow – at 1st ok, then muntah, xberak..
asyik kena ulang alik klinik je..
Hi Dr, 1st, u kena try beli susu dlm tin @ kotak dulu.asample pun xmembantu.sebab kalau takserasi, baby tu akan cirit birit or xboleh nak poo poo or ruam jugak.My 1st doter i beli susu S26.is good for her tulang, then dah besar skit susu anmum..2nd doter pulak..dari kecik dia xnak breast feed…end up 3bln jer dah stop breast feeding, kak bagi dia minum lactogen ajer….hehehe.alhamdulillah ok.
my baby drinks S26 Gold..alhamdulillah…no problemos….now she is on S26 Promil Gold since she is 8 month now..poo poo ok…sgt lawasss….and alhamdulillah she is not easily get sick..
dr…bella mesti nak dpt adik kn?? ?congrats mommy bella….sy suke tgk pkembangan bb bella…kalau ada muka die kat fb dr cepat2 like…. Hi kak, saya beri anak saya minum Karihome. Sblm ni minum enfa, s26, snow. semuanya dia tak suka dan badan dia naik ruam. Last2 saya try bagi Karihome Goat Milk. Suka sangat2 dia minum. 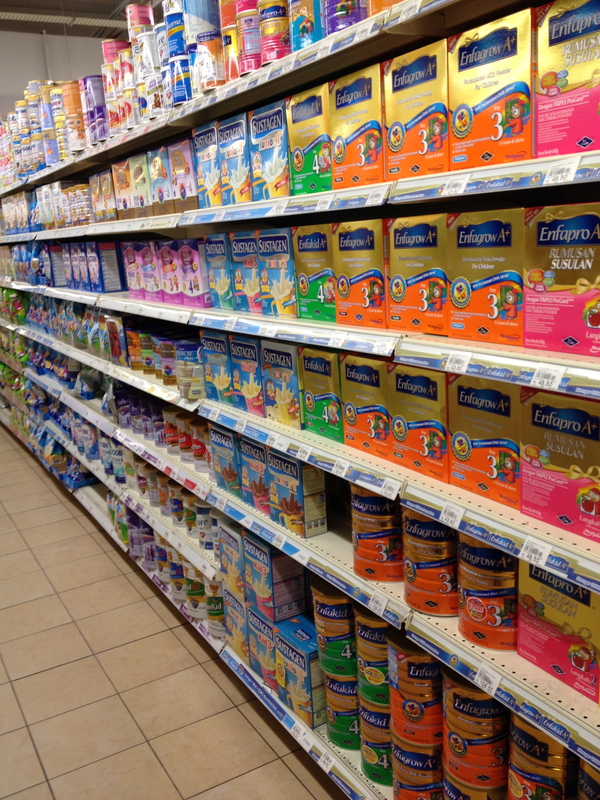 similac……raser pon mcm susu ibu….. I choose Karihome, Goat Milk. So far my boy don’t have any problem. bby umo bp yek tme kac karihome..?below 1 yer bley ke ae..
utk infant pun ada smpilah dewasa. susu karihome ok.. anak saya x perna termuak susu. aritu hanya sekali termuntah sebab batuk tapi susu yg dimuntahkan itu x berbau busuk langsung. Is there any online shop to buy karihome? Hardly to find it in stores. harga pon amat berpatutan, kan? duchlady sedap & sesuai dgn anak I.
anak i yg 1st minum anmum….alhamdulillah ok tak sembelit….sblm ni minum enfagrow..dia sembelit..
yup! setakat ni, enfalac a+ yg terbaik afta try 4jenis susu anmum, mamex, frisolac, lactogen.. pity my bby, mcm bhn uji kaji plak..
doc, saya share gmbr kt atas tu ye..
my first doughter drink anmum from baby untill now she is 4 years old already..I breastfeed my second one..and i’ll choose anmum also when the time to change to formula susu.. 🙂 ..yea i think anmum suit her since i took anmum milk for mama during pregnant so just continue to give my kids anmum.. 🙂 .. Same goes to me, aya…since im pregnnt till i hd 2nd baby i choose anmum for me n my childrens…my 1st son i try change to pedisure since my son didnt like to eat, but he refused it n dont want any milk. When i give him anmum milk again he cntinue he’s anmm milk. Dari umur baby saya 4 bulan, saya berikan anmum. Sbb saya continue pihak KPJ beri susu anmum semasa baby saya kena tahan ward. So far mmg ok, ramai jgk kwn saya bg anak2 minum anmum, badan nmpk pejal, kuat. Susu soya pun ok, tp bila minum kulit alergik. aaa ha aa ha…Bella nak jadi kakak!! Takde baby lagi tapi setahu saya dia kena try dulu, some kids allergic to susu lembu yang mana dia kena minum susu soya. I started to gv fm to my 1st child when he was about 2y 7m..not an easy journey..
but Alhamdulillah, he finally accepted dumex dugro fruit n veg..
cant wait for the next entry! my just turned 1 yr old daughter was bbf + given formula as well. started with Enfalac A+, then to Enfapro A+, now dh 1 y.o. i try to change to her big bro’s milk, Gainplus (reason being, boleh hantar 1 tin je kt nursery, senang). Alhamdulillah, she took it very well – no muntah/diarrhoea/constipation. Reason for choosing Enfa a+, because heard from so many ppl before that its the best FM in the market. The elder bro was given the same, then nak tukar to Enfagrow A+ at 1 y.o. tp dia constipation teruk sgt. hence the Gainplus. trying to give premium brands selagi termampu. haha.. but yes, it depends on the baby too. if it were to be me, i would start with the best (that i know of), tgk lah mana yg baby boleh accept. i faced some probs when it comes to introducing Afi with formula milk. try beli Anmum coz no added sugar kan. But gosh.. he refused. Tolak mentah2 lepas rasa. Ok then positive.. try campur dgn milo sikit anmum tu nak bagi ada rasa choc. Pun tak nak. Pulak tu dia sejak 6 bulan memang minum susu pun guna cawan. EBM pun minum guna cawan kalo time i tinggal nk pegi kuliah. Then try bagi sustagen, pun taknak. Masa dia masuk 2 tahun, dia suka jugak la minum susu Dutch Lady Kid (kurang manis) yg dalam kotak tu. (Dutch lady kid for 1-4 y/o, Dutch lady School for 5 y/o onwards). Then i refer kat doc yg jugak kwn kakak i.. dia cakap kalau anak taknak susu tepung.. takpe bagi je fresh milk. so kitorang bagi susu dutch lady tu la. As long as dia nak. Dari taknak langsung kan. Coz katanya kandungan susu tu sama je dgn formula milk lain. Cuma bezanya ada perisa choc n strawberry je. So skrg ni bagi susu tu je lah. Yes my prob maybe lain dgn other mums out there hehe.. smpai nak kena bg susah kotak. Tp suka jgk tengok coz susu kotak ni.. dia jadi trus jadi independent sket la..ambik sendiri, bukak straw tu sendiri.. cucuk sendiri n minum srotttt. hehe. berpinar rasa mata tuh kan.. huhuuu… byk nyer susu… sy rasa kalo kita nak pilih jajan pun tak pening mcm nih… 😉 .. gudmluck laa dr..
Pediasure for my son since he was 1 on advice by the paed – that time he was having cirit birit and loss of weight n being picky eater at the same time.he is now 3,still drinking pediasure. **SUSU kotak, bukan susah kotak** typo kat previous comment. anak i minum susu isomil (soys base)….susu lembu dia tak leh nak telan..muntah sesaje..
My daughter drink Enfagrow A+…!! dah try banyak dah but Enfagrow is the best! salam doc…im a pharmcy stdent..juz gve my opinion…try dis..http://ilham4u.com..juz so u know yet…susu yg diperkaya dgn buah badam,kurma,kismis dan terapi bacaan 30 juzuk alquran…insyallah..
My son minum mamex dulu..lpas 2 thn i tukar ke gain IQ so far sgt ok! yang 2nd..every 2-3 months kena review susu..hahaha. saya selalu mintak sample susu..kat klinik banyak letak sample susu..
test dulu..kalau ok baru beli tin besar..
Are u preggy Doc? hehehe.. My son drink S26. kena try n error juga, tak semua susu sesuai untuk anak kita..
try the karihome Milk or organic Milk..
Anak saya 23.6.2012 ni cukup setahun.so sy tukarkan susu dia ke enfagrow tp anak sy tak suka padahal sebelum ni mmg kuat menyusu..
kalau bella dah lebih dari setahun nanti, boleh bagi dia fresh milk. Better than formula milk. Can’t wait for next entry. Good news perhaps? Enfagrow, so far enfagrow has a highest DHA, for baby brain development. but for sure cannot believe in milk company rep said about their product, so do some research and comparison by yourself. I’m not believe in less sugar milk, sure they added sugar in FORMULA MILK.. because it is a formulated milk. For me if the milk is expensive, sure they formulated the milk very neat..
i bg my son susu ILHAM..tp susu tu kena bg bila dh enter 1 years old..susu ni ada cmpuran badam + kurma + kismis..my son suka sgt..mama2 yg preggy pun bleh minum..
tak ralat sgt coz dia pun dah 2y++..
sebelum wean off him, i mmg plan nak kasi Anmum..dgn harapan dia boleh terima susu tu..so that tak payahlah i kena try byk jenis susu formula..and praise the Lord, dia boleh terima susu tu..hehe.. I agree with the above commentator. Bagi fresh milk. My kid loves it more than formula:) I even bought a nice feeding cup to get her interested. A doctor told me if the kid is eating well, she doesnt need the vits in the formula. I was told that in western country, they only gave formula up to 1 y.o. But if u wanna give her formula, maybe can try formula that has less DHA. As some formula has strange or fishy taste due to the high DHA content. Good luck in finding the right one. Hope evrything goes well! my baby pun minum anmum smpi skrg..umur hampir 3 thn..so far x de problem. nape ye nk bg bella fm..but u hav a reason rite..
nape ye da nk bg bella fm? but u must be hav a reason rite..
Doc, pls consider goat\’s milk. i think it\’s pretty much better than cow\’s milk.. susu kambing fresh is the best option. kalau x dpt fresh boleh try instant spt Karihome, Hira\’ etc. i heard good review of those brand. utk dpt the best susu ie susu ibu, cbe Doc cari ibu susuan kt bella. your sisters ker?? Doc, pls consider goat’s milk. i think it’s pretty much better than cow\’s milk.. susu kambing fresh is the best option. kalau x dpt fresh boleh try instant spt Karihome, Hira’ etc. i heard good review of those brand. utk dpt the best susu ie susu ibu, cbe Doc cari ibu susuan kt bella. your sisters ker?? Owh…. Bella nk dpt adik ke? I guna isomil for my son. Soy based milk. Assalamualaikum… Hi Halina…actuallynya da lama follow blog ni… Bella mmg pandai posing ek. :-). Dia dah nak dpt adik ke…kalau ye pregnancy bukanla an absolute contraindication utk cont breastfeeding.. i always admire ur determination to breastfeed ur daughter exclusively walaupun bz oncall- anaest plak tu. Teringat Masa time kita registrar dulu siap kena mintak tolong sis in law jadik ibu susu sementara on call sbb x sempat perah byk. Ok gud luck! Enfalac A without flavor, since my son 8 months until today…. 3 years old. as for other mothers. i also thinking to give the best to my baby. At first yes I give her anmum. because there is no sugar added and whatsoever. however, my baby cannot cope well with that milk. she got warded for 2 days just because she not po-po for about 4 days. doctor trying very hard to push it out. looking for my baby crying i’m thinking to give her another formula milk. then i choose another milk. also a bit expensive one. cannot remember the brand. then same thing happened. finally i decide to give the cheaper one. dumex. until now she’s fine and healthy. you’re pregnant?? i knew it! congrats! kata nk 10 anak kan, haruslah pantas..hehe. Hi doc..susu dh drop ke? Mst sedeyk kn nk cerai susu bella br 11m. Anak sulung sy.after 6m campur susu.sbb berat die x cantik..sy bg prefisure la..konon bole bantu naik kan berat n selera..then tukar ke enfa n susu mahal2 la sume..tp dia mcm tu jg.slim.. Mayb ikut genetik i n hubby yg mmg slim la..lastnye until now 2y+ dutch lady je..
My 2nd..still bf..tp kalau umah bs topup kn dgn karihome goats milk..dutch lady pn dia ok jg bile fulus kurang memberansangkn la..hihi..
i chose Anmum since my kids age 3 mths [now dh 5 n 4 yrs]. so far no probs… and they’re kindly active, fast learner n always fit w/pun blk dr travelling. kurang demam,etc pun ya jugak. so, masa u nk beli SF nanti, dnt forget to check and compare the label. take ur time n happy hunting…. Bella nk dpt adik….. x leh manja2 dah dgn mummy & daddy…. my niece and nephew also drink anmum…and i think anmum is really2 good for baby..anmum byk meransang their brain….i think ur should choose anmum for little B..
lagipun bau susu anmum sgt wangi..n can attract baby to drink it..SeLaMat mEncUba..
Pediasure, since my little princess tolak anmum, dutch lady, dumex, enfalac. So bila akhirnya dia boleh terima susu pediasure, terus continue sampai skrg (+ bf). Salam Dr. Halina. yes, it’s depending on the baby itself. You can try buy small package first. i thnk my son got prob like ur bby…at first i bg dtch ldy,for a few mnths it was ok,then he got diarrhea.so his paed was advce me to chnge 2 anmum essential.Alhamdulillah its ok 4 a few weeks,but then turn 2 severe diarrhea again for almost 2 months,n now his paed advice me to go 4 lactose free milk..so luckly me 2 find u here,i just wanna confirm wit u,is similac is the best lactose free milk out there?how about enfalac?i’m in doubt 2 choose my best LF milk for my 1 y.o Umair..
I’m not sure about Enfalac. Since the doctor advised me to use Similac LF, so I just stick to that one. My sister also gave Similac LF to her son before. After one year, she changed to Lactogen. It is depending on your son indeed. You can have him try Enfalac. Try buy for small package first. If his tummy ok with it, then you can carry on with it.. =) Good luck! Hi… Maira is 3months old… and shes consuming EnfalacA+ ….. susu ni serasi dgn my daughter ni.. siang dgn FM mlm bru df.. nk wat ebm, tp since day1 milk production tu xbape bgus.. and day 2 nurses dh bg my daughter fm of enfalac A+..
hai doc…just nak share…enfalac A and enfagrow is the best…DHA dlm susu ni tinggi,my niece start minum susu ni dr baby dan smpai skang, byk perbezaan dgn kanak2 yg minum susu lain…bila belajar cpt sgt diaorg fhm dan ingat..doc yg slalu rawat diaorg pun recommend kan susu ni…my niece tak smpai setahun dh blh ingat ABC smpai Z..hehe..
u should check out susu ilham.nvr try but very famous.diff from other fm.contains badam ayat al quran dll. bole try susu ilham kot Dr. baby saya guna s26 skang ni.ok xde masalah..umur dh 10bln..muda 1 bln dr bella..
tgk feedback psl susu ilham ni pun ok je..nnt sy pun nak try susu ni utk bab sy..
My paed in japan suggested fresh milk after 12 months. Masa baby 13 months, saya preggy balik, and atas reason2 tertentu tak dapat nak fully breastfeed time pregnant, so siang2 saya bg fresh milk, minum dalam cup, mlm baru breastfeed. Anak saya dah 4 sekarang, semuanya bfeed dan terus introduced to fresh milk. If im not mistaken, fresh milk punya kandungan gula lebih rendah dari formulated milk kan, doctor kan? my baby caliph minum Mamex gold step 1..and after this ada banyak step lagi…this milk bagus i rasa sbb dia ada immunoforce (hahaha..betul ke eja ni..) yg bantu stimulate good bacteria…heheh..mcm doctor plak i ni..hehehe…. Salam dR, i choose for my bloved dotter is Anmum…btw congrate in advance for u!!! How about you try herbalife.My senior all used this for their babies.Teir babies grow alhamdulillah very well and healthy.Full of nutrition,delicious and safe!! the 2nd best milk after mother’s milk is goat’s milk. pilih yang popular at5 tv…best quality!!!!! :)…good luck kakna!!! ever heard of susu ilham?contains ekstrak badam,kurma,kismis + terapi alQuran..sgt bminat nk try tp blum bkesempatan..
Bella nak ada adik dah ke? hehehe..I guess..
bg minum milo. cool ape. hehhe. jk. Amboi byknya opinions..jenuh DR halina nak baca ni..Dr anak2 sy ckp,xyah dok sibuk2 nak amik tau pasai DHA la, gula la dan mcm2 lg dlm susu formula tu..bg jer fresh milk..sbb kt US etc kbykn parents bg fresh milk..ok je anak2 diorang tu..Dr tu explain this bila saya mula curious about DHA dan susu apa yg sesuai ngan budget dan progress my kids..xtaula plak pdgn paed yg lain..sbb fresh milk mmg non-added sugar..huhu..
am juz preggy and takde rezki, am misscariage..my son already 1 year 9mth..
Hi doc! Mum gave me Isomil (soybean milk) when I was a baby. She still give it to my youngest sister. It was recommended by a doctor. So far that one is the best milk. Mum did try gave me few other brands but they aren’t suitable for me & the sisters. So she gave us Isomil. A doctor said, “cow milk (the other brands) is for calves, soy bean is for babies). Not sure tho, but I guess that statement is quite true. my doter sejak lahir dia minum byk susu jugak..
tp tgk gak camne body baby sesuai atau tak..
salam..hai bella;’s mommny…my lil bby rayyan minum enfalac AR since 3month..after 6 month plus pakar pediatric suggest susu snow P7A untill 1 year..actually u have to choose the suitable milk for bella xkira susu tu murah atau mahal yang penting susu tu xganggu perut dia, xmengakibatkan muntah n xcirit birit or rashes…insyAllah..
Salam Dr, lamonya dr tak mengupdate. Rindu ngan Bella ni. Ha ! mesti dr nak kasi Bella adik ni ! Untuk susu tu, anak akak yang pertama hingga ke ketiga semuanya minum Snow. Yang keempat ni minum Lactogen aje. Harganya pun x lah mahal sangat. Anak akak x ade masalah setakat ini. Suka aje dia nampaknya. Wah, B dah nak dapat adik… (saja speculate, ngeeee). Both my kiddos take Novolac. Tried S26, Anmum, no go. Son had constipation problem so Novolac was good. Here’s where you can find it http://delfimarketing.com.my/news/6-where-can-i-find-novalac-in-malaysia.html .Daughter is being mix-fed, so it’s breast and Novolac. However, it’s surprising that most mothers here commented that weaning meant pregnancy. Although breast milk production do drop, it is still possible and advisable to continue breastfeeding through pregnancy. Maybe I didn’t quite get what they meant. Unless it is to wean to start the fertility cycle again. It’s all trial and error I guess. From what I’ve learn all formula milk has sufficient basic requirements for all babies, what differs from one another is their additive supplement like how they advertise, hence all the pricing difference and so. All formula milk step 1 and 2 (below 12m) has higher nutrition compared to step 3 and 4 (above 12m), so most of them are pretty much good for babies. The important thing to try and see what suits B’s preference and tummy. Whether she accepts a certain brand or not. Another thing that I’m fussy about is how well or easy the formula mixes, I have experience certain brands that requires rigorous mixing or requires a certain degree of water to mix well which ofcourse is something that I don’t fancy.. When changing to step 3 pulak, you will experience a different level of formula milk with certain brands, most commonly – excessive milk fat residue (in the bottle, after feeding). Again, it’s all trial and error Doc 🙂 Btw, my son settled for Anmum step 1 and 2 and Isomil, now he’s on Friso Gold step 3.. If you want details on all the brands I’ve tried and the results, I can email it to you 🙂 Good luck! diarrhea and treated at hospital for a week. It’s been over a year since I’ve written the comment and I have somewhat forgotten most of the finer details. But if you’re looking for a formula milk for babies over 1year which is not sweet, it’s quite tough as most formulas for above 1year has a more or less sweet taste, even though they say “no additional sugar” or “sugar free” because the sweet taste is not from sugar but other additives. During diarrhea treatment, doctors will usually recommend soy milk (isomil/nursoy/etc). Hope your daughter is recovering. my bby minum s26. mlm bf siang fm.. now dah nak masuk 10bln. mcm nak putus susu dah sbb susu dah makin kurang.. huhu.. so far, s26 nampak ok. takat ni br 2 kali, tu pun batuk n selsema. harga pun, ok.
so far i think yg ok for my babies enfagrow la. the price mmg mahal jugak, especially bila dah membesar ni baby minum byk.. yg ok nye sebab my babies tadak mslh nak poo poo.. pernah juga try bagi susu kambing when my milk not enough waktu puasa.. after the babies umur 6 bln.. mcm ok jugak, no sugar added.. and lebih mahal drpd all those formula.. yg i tau susu kambing lebih senang digest drpd susu lembu.. apa pun, mahal mcm mana pun kalau baby tak sesuai no point jugak..
i’ve try similac and gain plus when start to weaning my baby since previous my baby fullybf… 1. similac = susah nk poo poo…2. try enfagrow = cirit birit …. after a few trial now satisfied with ‘PEDIASURE’…..
JH, i think not advisable to bfeed when you are prgnt, boleh miscarriage.. in fact it will take some time jugak nak wean a baby. my fren still bfeed and prgnt in the same time, end up bila bersalin dua2 nak bfeed.. yg kakak menang.. kesian adik.. my opinion apa pun when you are prgnt better to wean your baby.. it took me 3 weeks to stop my baby from bfeed when i got prgnt.. nasib baik baby tak meragam.. So unless you are at a very high risk of preterm labour, breastfeeding through pregnancy is very doable. And so is tandem nursing. If not, how do one feed multiple births? Yes i agree on tendam nursing. Some mommies successfully did that either for twins,triplets or for toddler n newborn..
goat milk better than cow milk…bole request trial pack dari Karihome..ade lg 1 jenama Purenet..
try la susu kambing.. susu kesukaan Rasulullah s.a.w adalah susu kambing. dan susus kedua terbaik selepas susu ibu adalah susu kambing. kalo nak yg fresh try nubian goat milk.. kalo nak formula try karihome. try karihome infants formula. karihome is new zealand goat’s milk. like Rasullullah said susu kambing is next to susu ibu. Masa lepas lahir, anak saya pakai MamexGold sebab memang diberi oleh Hospital Pantai Ipoh..Then dah besar sikit dalam 1 tahun lebih saya tukar Pediasure. hehe..tahniah if you’re pgrenant. In my opinion it depend on your baby .. samada ianya sesuai utk dia / tak huhu..
My son too drinks susu ilham for nearly a year. Sy bg amanda earlier 1mnth cause tkder susu bdn… Hu3… Wpun mahal tp berbaloi krn guard protect yg bgus slain DHA yg tinggi vs susu len… Alhamdulillah smpai skrg my bby jrg dmam.. IQ dia pun leh tahan… Ms 2 1/2 bln dh blh mniarap,now 6bln dh slow2 mrangkak yg pling best dh pandai say “ibu”! Amanda cpat memahami arahan n apa yg kita ckp kt dia… Very2 alert! Can’t wait 4 da next entry..! Doc, maybe u can try Karihome goat’s milk..
yup, u can try Karihome goats milk… sangatttt bagus… susu terbaik selepas susu ibu is goats milk… structurally the molecule hampir sama dgn susu ibu…small molecule as like susu ibu so easy to digest… less allergy compare to cows milk… kulit baby akan jadi cantik kalau minum susu kambing… expensive but worth it!! biolac from era edar marketing…sbb ada kandungan examo dlm susu tu..i dah try bg kat ketiga2 anak i…i prefer bg mereka examo rather than susu2 kategori mahal yg extra kndungan mcm2 tu,coz examo ni dah ada kt pasaran since 1980..
pediasure d best for my son… dr. kpj ampang putri told me bout pediasure the best milk..
Hi Dr Halina. Baby boy dah 6 bln & still fully bf.Alhamdulillah.i pon sometimes survey2 gak biler dh smpai masanya if one day biler i nk change ke susu formula apa susu terbaik for my son.i baca better bg susu kambing dr susu lembu.malahan ikut sunnah nabi minum susu kambing. susu kambing khasiatnya lebih kurang mcm susu ibu. My doctor told me too that the best milk after mother’s milk is susu kambing. Sedikit mahal but it is the best compared to formula, And yes ikut sunnah Rasulullah SAW. My baby minum susu S26…dari lahir sampai sekarang dh masuk 7m…emmm…mcm ok..popo dia pn ok…nampak cergas…. Wah!! r u preggy DH? same to me..I stop BF to my little hero when i know i preggy..wah saper kater BF protection x preggy!!! ihiksss!! so far ok..but when my little hero start batuk, n cirit birit my paed suruh change to Lactose Free Milk, Dr Tan suggest (they called Mr.Tan, bcoz he is HOD pediatrics ) Similac Lactose Free, good for usus n perut baby..Untill now still stay wth Similic LF, good for my son!!! I prefer goat milk..Why goat milk?Kalau ikut sunnah, Rasulullah sangat sukakan susu kambing.. Kalau tengok sifat fizikal kambing itu sendiri, kambing lebih active manakala lembu sangat perlahan/lembab. Susu kambing adalah susu kedua terbaik selepas susu ibu. So, pada pendapat saya jika nak wean off baby, make sure teruskan susu yang terbaik..Susu ibu adalah terbaik,namun jika kita dah x boleh bf baby, kita boleh gantikan dengan susu kedua terbaik..pH susu kambing juga terbukti sama seperti susu ibu. Contoh plg jelas anak saya, dia dah setahun 6 bulan breastfeed, & minum susu ibu semata2.Namun memikirkan saya akan wean off my baby lagi 5bulan,so nak intro sikit2 dengan susu formula..As expected, she refuse all cow milk..(maybe rasanya xsama seperti susu ibu,siap luahkan balik) But i try dengan goat milk, terus minum..Alhamdulillah..
my daughter MINUM LACTOGEN.1-4 until now..bg dugro cirit birit,bg anmum dia tolak, bg sustagen, semua xsesuai..sehingga sekarang dah masuk 3tahun got no problem at all. Me still breastfeed but since susu almost kering so i started her with FM during day time and BF at night. Currently im in DUbai. one of the mums here suggest me LIPTOMIL product from sweeden. Excelantte! Google to get more info. i think in Malaysia ada but lil bit expensive but then its for our child so no harm..
hey there. kite punye baby pun nama sophia, she was born on 19th july. kebetulan huh. i was suprised when i knew that u named ur baby – sophia n they’re just 2 days apart came out to this world, ehehe! kite pun fully bf and start to wean off. tried more than 10 brands tapi my sophia still refuse. emm tiada susu yang dapat menggantikan susu ibu thought. want to share on fm fact. i read from health magazine n hopefullt it didnt bias to any brand lah kan. it shows dat only anmum je yang less sugar. susu lain katanya said no lactose but still contain hidden sugar. u know ell coz u r a doc, read the ingredients. started with Enfalac A+, then to Enfapro A+..sekarang anak saya sudah mencecah umur 1 tahun..sehingga sekarang tiada sebarang masalah..
Dulu pakai novalac… dah setahun ni tukar dugro fruit and vege. Alhamdulillah… ok! utk tahun pertama saya bg susu frisolac utk anak saya, stat umo die 1 lebih, saya tukar kpd susu Halibs. actualy, susu halibs ni keluaran orang islam 100%. saya pernah ke kliang proses susu halibs di kuala kangsar. saya amat yakin dgn susu nu, coz apabila tgk dr segi proses, semestinya kite nak bg yg terbaik utk anak kita. sebagai umat islam, kilang prses susu tu, 100% pekerja umat islam, sebelum msuk kerja perlu berwuduk, ayat suci al-quran sentisa dipasang. wanita yg period, tak bleh kerja. Susu tu ada dijual di mama ye? Coz mmber saya pun memcari susu yg diproses secare Islamik. Boleh ;la sy suggest kat die. Now cume tau Susu Ilham je. s26 gold. penah try anmum tp kalu muntah bau. same 2 mamil gold, stil bau..s26 biase pnah try gak p mudah kne flu, change to s26 gold antibodi ye pn tgi gk.. sush kne flu..
Salam doc. May i know why u wean her off? is it bcoz u r preggy or got some other reason? My Yusuf dah diberikan Anmum since dia start minum FM. Alhamdulillah, setakat ni, xde masalah. Super active like Bella. Commonly I do not examine content on sites, on the other hand wish to point out that this kind of write-up incredibly required us to take a peek with and get it done! Your writing style has been amazed me. Cheers, incredibly great write-up. SUSU anmum memang terbaik.. anak saya pon minum anmum jugak..
caused by the passion displayed in the post I browsed. And on this post Weaning B Off Mommy�s Milk.. | BARELY SUPERMOMMY. and buy some plumbers tape and silicone sealant. hi doc, maybe u can try karihome- goat’s milk? as a mother, before I let my son to consume the formula, I taste it first. I’m glad it’s not sweet just like any other formula plus it’s goat’s milk-second after mother’s milk. Pediasure for my picky daughter! She is 4 and started taking it 6 months ago (vanilla flavor, she loves it, a real girl). I have noticed great weight improvements since then.